Whether you go traditional with your inside-out pizza with ricotta and sausage or think outside the dough with a cheeseburger stromboli or primavera calzone, sometimes it’s good to wrap things up. One simple way to update your pizza selection is to turn the pizza inside out. 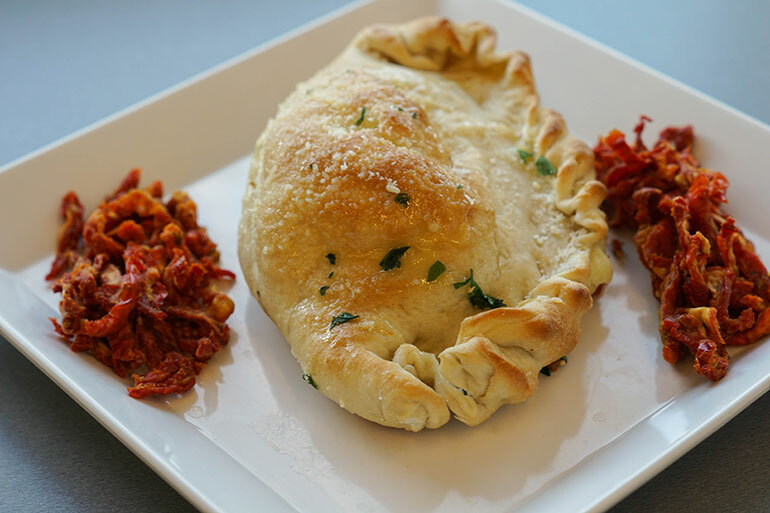 The calzone, and its cousin the stromboli, are a different experience with a much-loved menu item…the best of both worlds, with the ability to go classic with Italian deli meats and the possibility of “pie in the sky” with crazier fillings. Plus, there’s the portability factor (the word calzone translates to “pants legs,” as it could be eaten on the go). First, let’s get some terminology out of the way. Simplified, calzones are more like pizza and stromboli are more like a sandwich. Another way to tell the difference is the sauce: Stromboli’s sauce is inside, while the sauce for a calzone is usually served on the side. 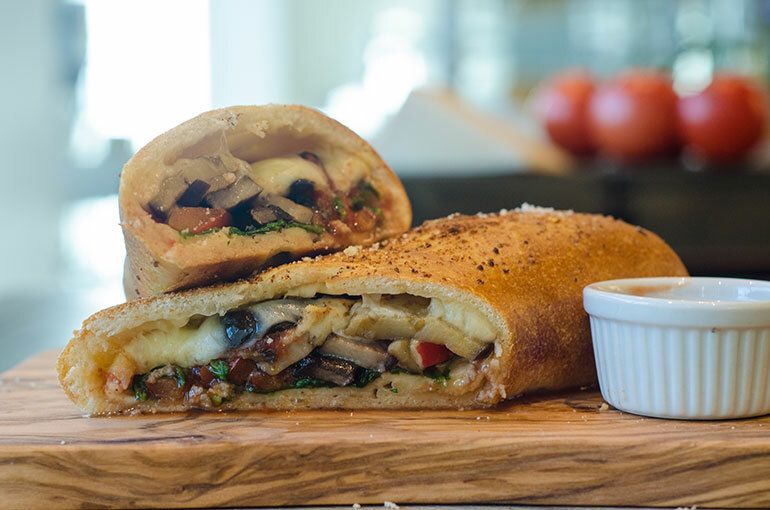 Another way that calzones are more pizza like is the toppings: sausage, mushrooms, pepperoni, peppers, onions and all the rest are common for traditional calzones. But you’ll find more Italian meats like capicola or salami in the stromboli. Still not sure? The shape will be a giveaway: Calzones are half-moons and stromboli are more like a log or roll. Calzones first appeared in Naples, Italy, in the 1700s, and were sandwich sized. But people didn’t eat them out of hand like Hot Pockets; it was customary to eat even single pieces of pizza with a knife and fork. Another distinguishing point: Stromboli didn’t originate in Italy—they were born in Essington, an Italian neighborhood in a town outside of Philadelphia. 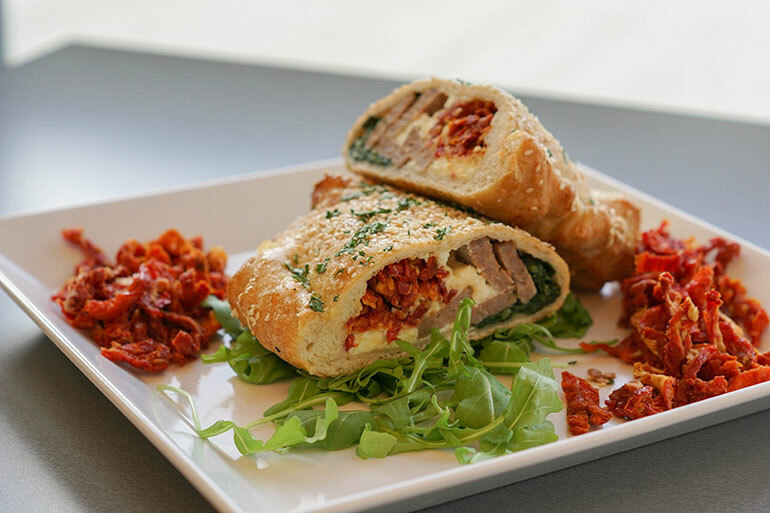 Both calzones and stromboli are served at Stonybrook University’s Italian Express concept in the East Side Dining venue. The focus here is on classic Italian meat and cheese combos. George Apanasevich, CulinArt chef on campus, pays attention to the dough and cheese above all, though. Cookbook author and 12-time World Pizza Champion Tony Gemignani recommends a high gluten-flour (which will make the calzones get more golden brown) and malt, another browning agent that acts like a sugar. 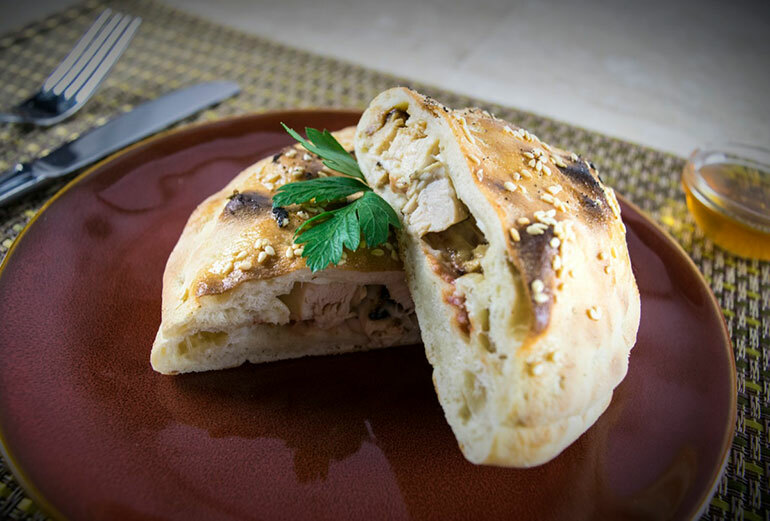 Eurest’s Piccola Italia program, created by Eurest chefs for use at accounts across the country, features some off-the-beaten-path calzones and stromboli. There’s the cheeseburger stromboli, the primavera calzone, the eggplant portobello stromboli and the lasagna calzone, which brings together all the best parts of lasagna together with a calzone. Magnifico! 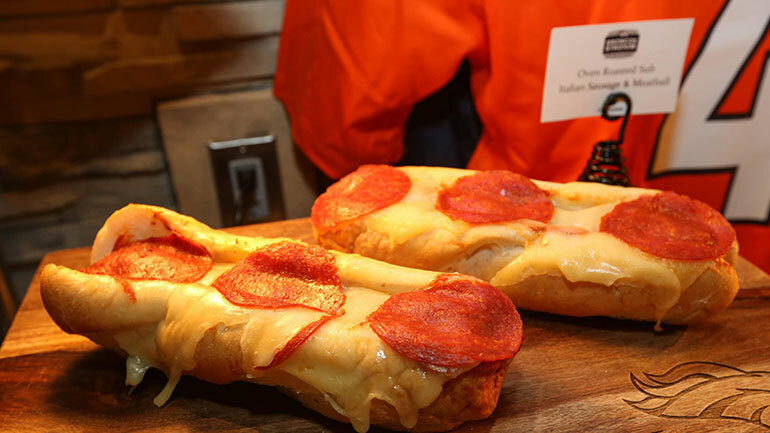 For Broncos games in Denver, Centerplate Chef Chris DeJohn and his team have been going freestyle with the calzone model. Oven-fired subs are a melty mix of mozzarella, marinara and a choice of local sausage or Italian meatballs on a hoagie bun. Other trendy calzone ingredients to consider include specialty ham, walnuts as a meat substitute, pulled jerk chicken spiked with honey and even smoked salmon, crème fraiche and chives, evoking Wolfgang Puck’s famously game-changing “gourmet pizza” of the 1980s. Minimize the amount of liquid you use. Don’t slather on pizza sauce or tomato sauce, then pile your ingredients on top of that. Instead, use less sauce and mix it directly into the filling, creating a dense mixture. Shoot for about an eighth of an inch in thickness for your dough. Much thicker will result in an extra-firm crust that is difficult to get through once cooked. Leave only about an inch of space around the filling and the edge of the circle of dough. If you leave more than that, you will end up having large chunks of baked crust around the curved side of the calzone after baking. This border is also necessary to seal the dough before the cooking process. Seal the edges firmly to prevent leakage, then brush a bit of egg wash over the dough before crimping the edges with your hands or with a fork. Preheat the pizza stone and sprinkle it with a bit of corn meal to get the bottom of the calzone nice and crispy. Cool your calzone briefly before cutting and serving. 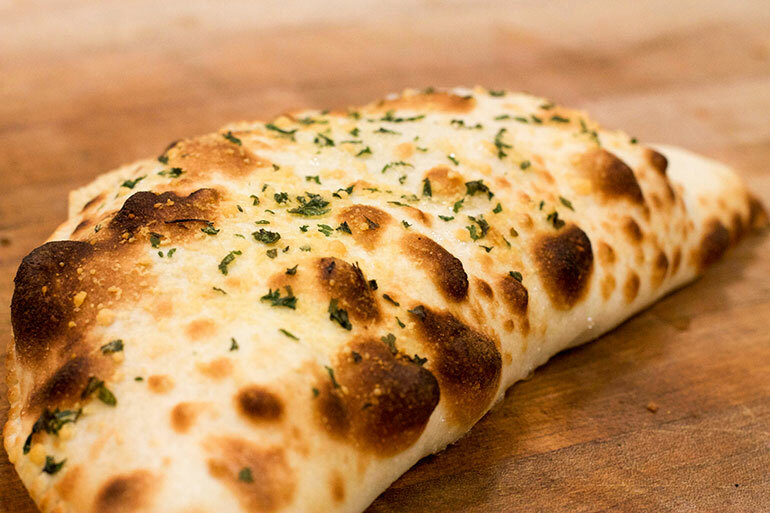 At UNT’s central bakery, pizza dough is made with imported Italian flour, and then the rest of the ingredients that go into calzones served at old world-style pizza concept Mia’s follow suit: the best possible for a calzone experience that’s molto bene. 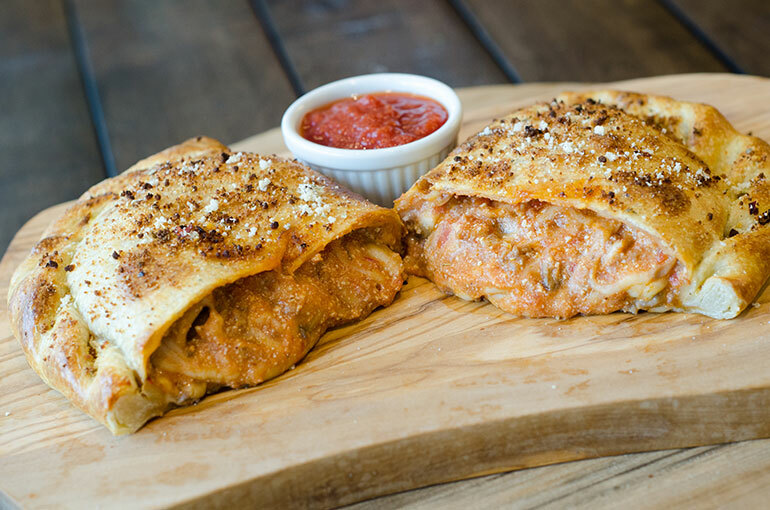 Americana: This calzone features ground beef, smoked cheddar, fresh mozzarella, sautéed onions, San Marzano tomato sauce, seasoned salt and pepper in a golden-brown olive oil-coated crust.